The idea of a sporting club was originally put forward by two land developers, John Landau and Charles Cohen, who thought it would be a good way to attract residential buyers to the newly formed area of Auckland Park. So it was that the manager of the Auckland Park Real Estate Company, Herbert Moss, convened a meeting of prominent citizens to test the water: men such as Lt.-Col. Gordon Sandilands, commander of the remaining British force, William Dalrymple, who would soon build his house Glenshiel in Westcliff, Charles Ward, a foremost lawyer and silk, and Archdeacon Michael Furse, who would soon take up residence in his house, Bishop’s Kop, at the top of Gale Road in Parktown. 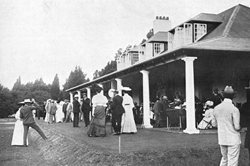 The proposal for a Club was put to these gentlemen, and it was agreed that the Auckland Park Real Estate Company would construct and equip a suitable clubhouse. The Company would own and run the Club for two years after which the lessees would have the option of buying the freehold at an agreed price. Squash courts (still standing), tennis courts, a swimming bath, croquet lawns and a cricket pitch were all to be constructed and stabling for horses provided. Polo and even hunting provided some adventure and a taste of “home” for the many expatriates in the town. The hunt involved a sack smelling powerfully of jackal being dragged along a course which led down what is now the Parkview Golf Course, up through Parkwood and around the Sachsenwald (Saxonwold) and Hermann Eckstein Park, back to Auckland Park. A golf course was laid out at a cost of £10 000, which extended up into Brixton and involved the crossing of many suburban streets. The Club offered various indoor activities, such as whist, rummy (poker not being permitted until 1937, when it was agreed that it “was not a game of chance”), and, of course, billiards. The original Club House was built on the site of Lindeque’s farm-stead – and the existing Club House, too, stands on this site. A perennial stream, which is believed to rise on Brixton Ridge, flowed through the farm, feeding a dam which Lindeque had built. This dam was to become one of the main attractions for the Club: it was converted into a willow-fringed lake, reedy and placid, on which the beaux of Johannesburg could punt with their young damsels. The Club was officially opened on 22nd December 1906 by the Mayor, with a membership of four hundred. Originally established by the Randlords in the 1890s, Parktown is an extensive and diverse suburb which comprises about 300 houses, 750 flats and a number of institutional and business properties. The Parktown Association, which interfaces with a range of statutory and institutional bodies, represents its members and their interests whenever called upon to do so.